Based on the advantages of nondestructive and noninvasive technique, high stability and continuity, currently, the low-field nuclear magnetic resonance (NMR) analyzing and testing technology (low-field NMR) has been used to characterize the initial hydration process of cement slurry system. As a kind of cement-based material, class G oil-well cement has been widely used in various cementing operations, and the basic research of class G oil-well cement has aroused wide attention. Simultaneously, microfine cement plays an increasingly important role as reinforcing material, especially in the cementing operation of low-temperature formation. Besides, the main advantage of Carr–Purcell–Meiboom–Gill (CPMG) technique with other spin echo techniques is that it allows rapid multiple accumulations of the echo train signal—an important issue in increasing the detection sensitivity at low fields. 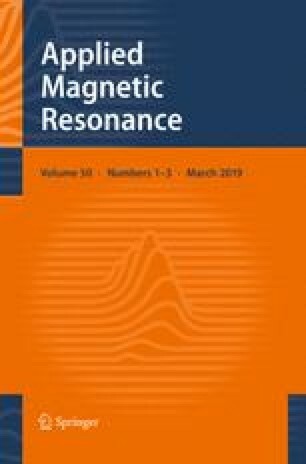 Therefore, during this study, the initial hydration process of class G oil-well cement and microfine cement was characterized by the values and distribution ranges of the time constants T2i [the attenuation of the function of the transverse magnetization 2 (t) was measured by means of CPMG pulse sequence, normalized to an initial value 2(0) = 1, and decomposed into a sum of exponential functions 2 (t) = Σ pi exp (− t/T2i) with the fractions Σ pi = 1]. As a result, it was confirmed that the low-field NMR has a great advantage in the characterization of early hydration reaction of cement-based material.